Protesters stage an anti-FTA, free trade agreement, rally against U.S. beef imports in front of the Foreign Ministry in Seoul, Tuesday, Dec. 5, 2006. Republic of Korea has rejected a US demand that talks on forging a free trade agreement (FTA) include a dispute over US beef exports, officials said Monday. The disagreement prompted Washington to postpone a working-level FTA session on sanitary conditions for the import of agricultural products, the Ministry of Agriculture said. "The session planned for Tuesday and Wednesday in Washington will not take place because of a dispute over the agenda," it said in a statement. The fifth round of full FTA talks was clouded by RoK's decision to ban three shipments of US beef over small bone fragments, even though it has lifted a three-year import ban imposed over US cases of mad-cow disease. Under an accord signed in January, RoK will only permit imports of boneless beef from US cattle aged less than 30 months. 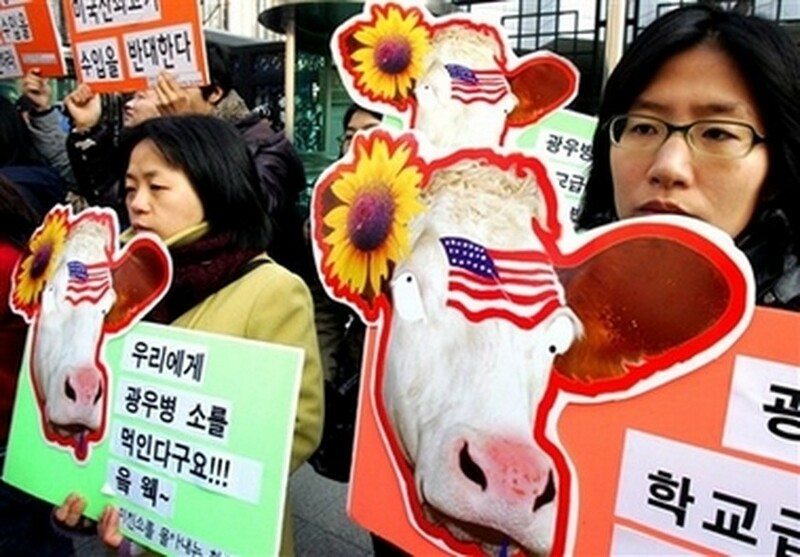 In a heated response, US Agriculture Secretary Mike Johanns accused RoK of using underhand tactics. Seoul's agriculture ministry said the US wanted this week's session to include the beef issue as well as the easing of import bans on poultry products during bird flu outbreaks. The US also insisted that any outbreak of bird flu in a particular US state should not affect poultry exports from other regions. The next round of full FTA negotiations is due in RoK in mid-January. An agreement with RoK would be the United States' biggest deal since the North American NAFTA pact in 1994, marrying two economies whose bilateral trade last year totalled 72 billion dollars. But RoK has seen a series of sometimes violent protests against any agreement, led by farmers who fear their lifestyle would be doomed by cheap imported food.